When roaming around the Internet, I found these amazing Spring buys from Topshop. 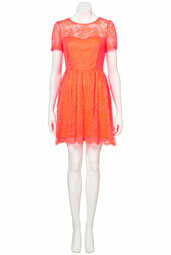 They are out of my budget soo obvious I can't buy them, but Topshop can be very expensive for high-street sometimes. Still, Some of these buys are reasonably cheap like the floral mesh dress. But they are soo fresh & spring like, I am expecting the baby lambs & daffodils to pop out while I'm having a nose at them !